Hot colored wax, shimmering foils, images, bits of text, ephemera, and layers of transparent glazes are what make these mini collages fabulous. Small enough (3x3.5) to display on tiny spaces, adorn an altered journal cover, or as an artful hanging ornament. The first part of the class will be dedicated to the basics of painting with hot colored wax. I will show you how you can paint a landscape in 60 seconds and how to make monoprints of your work. The second part of the class will be dedicated to designing three or more mini collages using the monoprints. I will furnish the wax, the thermal tools and paper. Other samples of my work will be available for inspiration. Please join us for a day of fun and artful explorations. NEW CLASS soon to be available. 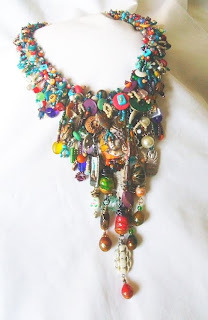 Learn to assemble a STATEMENT NECKLACE using all the treasures you have collected and then some. Emphasis on design and the different ways to attach the components. This sample photo is just one of many designs to be inspired by. Each will be original ....each will be fabulous. Contact artwithmoxie@cox.net if you would like to be part of the class. Limited seating, register early. CLASS IS FULL...CONTACT artwithmoxie@cox.net TO BE PLACED ON THE SECOND WAIT LIST AND FOR THE NEW DATE LISTING.